1. A design; often refers to chest radiographic findings. 2. In dentistry, a form used in making a mold, as for an inlay or partial denture framework. 2. dentistry A form used in making a mold, as for an inlay or partial denture framework. n in therapeutic touch, an energy field's characteristic that gives the field its identity. Even behavior is considered evidence of a changing energy pattern. n the preferred motion pattern of alternating fascia at the body's transitional areas, classified by osteopath J. Gordon Zink. n generally constellated sites of pain associated with a particular health condition or dysfunction. n.pl systems in which the preferred directions of motion for fascia throughout the body are classified and recorded. A combination of acts or parts, forming a consistent or characteristic arrangement or behaviour. A pattern Neuromuscular anomaly of the eyes characterized by an increase in exotropia when the eyes fixate downward, or increase in esotropia when the eyes fixate upward. Upgaze and downgaze are usually measured at 25 degrees from the horizontal. Syn. A syndrome. See convergent strabismus; divergent strabismus. 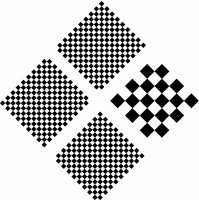 checkerboard pattern A square set of equal size black and white squares placed adjacent to one another. It is used to test visual acuity. The common way of using this pattern is to present it in the form of a square diamond made up of four smaller diamonds. Three of these are composed of a pattern of much smaller squares than the fourth. Resolution of the pattern with larger squares consists in indicating where it is located (top, bottom, right or left) while the other three squares appear as a uniform grey. This acuity test is less dependent on cognitive factors than letters. (Fig. P4). See visual acuity; test type. V pattern A neuromuscular anomaly of the eyes characterized by an increase in exotropia when the eyes rotate upward, or increase in esotropia when the eyes rotate downward. Syn. V syndrome. See convergent strabismus; divergent strabismus. X pattern A neuromuscular anomaly in which the visual axes are more divergent when the eyes fixate upward and downward, as compared to the primary position of gaze. Y pattern A neuromuscular anomaly of the eyes in which there is increasing exotropia as the eyes rotate straight upward with orthotropia in the primary position and on downward gaze. 1. In dentistry, form used in making a mold, as for an inlay or partial denture framework. 2. A design; often refers to chest radiographic findings. n a form used to make a mold, such as for a denture, an inlay, or a partial denture framework. n a facial growth pattern in which the face appears short and wide, the mandible is considered strong and has a squared-off appearance, and the dental arches are broad. Deep anterior overbites, usually resulting from skeletal abnormalities, are present. n a facial growth pattern in which the face is long and narrow, the dental arches often exhibit crowding of the teeth, and the musculature is weakened. Anterior open overbites are often present because of the vertical growth pattern of the mandible. n a facial growth pattern in which there is a normal relationship between the mandible and maxilla and the face appears neither too long nor too wide. The jaw characteristics and dental arches are also harmonious. n the form or design of the occluding surfaces of a tooth or teeth. These forms may be based on natural or modified anatomic or nonanatomic concepts of teeth. n the trabecular arrangement of alveolar bone in relation to marrow spaces; may be radiographically interpreted. n 1. a wax model for making the mold in which the metal will be formed in casting. n 2. a wax form of a denture that, when it is invested in a flask and the wax is eliminated, will form the mold in which the resin denture is formed. Q. Which would be the best diet pattern for a woman to have a flat stomach? I am worried about my weight. I have been constantly gaining weight for past few months and I have gained a large belly. I am just 19 years old. I would like to lose weight desperately and I am clueless on the diet pattern that I should be following. Could someone please help me out? Which would be the best diet pattern for a woman to have a flat stomach? Q. Which would be the best diet pattern for a man to have a flat stomach? So far, more than 80 percent of the total area of patterned ground discovered on Mars is in regions where the Odyssey probe measured large amounts of hydrogen buried just beneath the Martian surface at southern latitudes (SN: 6/8/02, p.
That strongly suggests that these areas of patterned ground have a glacial origin, says Klima.